CDC Packaging was launched in 1993 by three partners with extensive experience in the crating business. Now, there are 30 employees working in the workshop and the front office, including two of founder Bob Cook’s daughters. At first, CDC Packaging operated out of a 3,000-square-foot workshop in a building that also housed a machine shop and a mill-working business. Over time, we expanded into larger spaces, built on additions, and recently moved to a new location with 17,000 square feet of space. Early customers included Eaton Corp., Energy Science, Inc., Muth Associates, Stephen Gould, Raytheon, and Lucent Technologies. Some of those companies are still on our customer roster today because of our consistent ability to meet deadlines and provide superior customer service. CDC Packaging is proud to have helped our customers ship at least $7 billion worth of equipment during our first quarter century in business. Learn more about the early days of CDC Packaging. 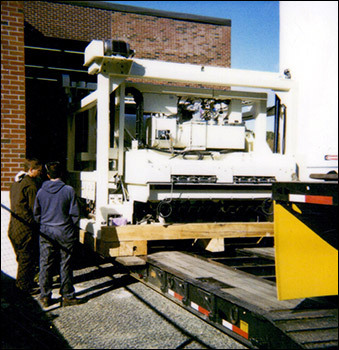 The largest item CDC Packaging ever shipped was a 55,000-pound vulcanizing machine. We built a heavy-duty skid using 8” x 8” oak lumber to support it and used a crane to hoist it onto a flatbed truck. 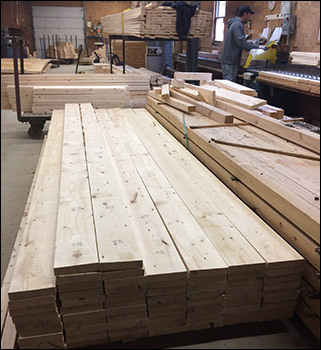 Every year, we use approximately 300,000 board feet of lumber, plus 12,000 sheets of plywood, to build crates for our customers.